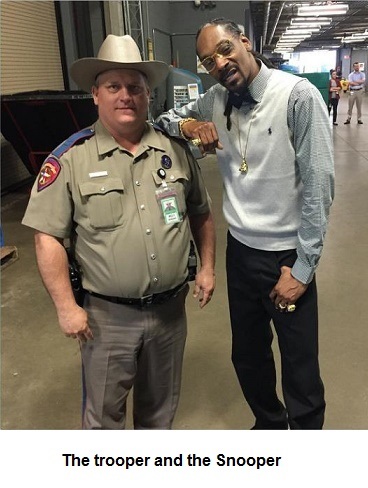 According to documents released today by the Texas Department of Public Safety, DPS director Steven McCraw personally initiated the reprimand of Trooper Billy Spears after Spears was photographed with rapper Snoop Dogg, whom McCraw described as a “dope smoking cop hater.” Meanwhile, other documents raise more questions than answers about DPS’s use of facial recognition software (more on that below). In a March 21, 2015 email, Spears’s immediate supervisor, Sgt. Michael Sparks, explained that Spears allowed himself to be photographed with Snoop at the request of the Doggfather’s assistant, and that Spears and other troopers had previously been photographed with “Robert Duvall, Cee Lo Green, Fred Armistead, Rob Zombie, Shaquille O’Neal and others” while working backstage at the SXSW concert in Austin. Apparently he would rather work the convention while on a week’s vacation to earn additional money rather than take an additional tour on the border. He must not understand that he was being lampooned by a dope smoking cop hater which reflects very poorly upon the Department. Wow. So this is the kind of emergency issue that keeps our top cop awake on nights and weekends. I’m glad to know we have our priorities straight. I’ve never met Col. McCraw and I don’t know much about him, but he sounds like a crotchety old man. As I’ve explained before, Billy did not even know that Snoop Dogg had a criminal record, but then Col. McCraw didn’t seem to care about any of that. I’ve obtained dozens of emails from DPS, and it’s almost comical to follow the email strings as supervisors from all over the state are directed to identify the trooper who had the audacity to be photographed with Snoop Dogg. Deputy Director David Baker sent out an email asking, “Will one of you claim this trooper??? ?” It’s good to know that our state’s top law enforcement agency is working overtime on such a pressing matter. You may recall that I filed an open records request on April 1, 2015 asking about DPS’s use of facial recognition software. DPS still has not explained how it became aware of the Snoop Dogg photograph, although DPS’s facial recognition software (“FRS”) apparently did not locate it on social media. Nonetheless, DPS still refuses to say whether it uses FRS to monitor employees on social media. In response to the open records request, DPS produced a copy of my original March 30, 2015 email asking whether DPS used the software to monitor employees, and that email was forwarded to others in DPS. In the March 31 forward to DPS employee Tom Vinger, DPS employee Summer Blackwell wrote, “I doubt we are… but who would be able to tell us for sure?” That’s the end of the email string, and I’m still waiting for an answer to my question. One of the more interesting documents is the Q&A where DPS employees try to anticipate questions about DPS’s use of biometric data, i.e., finger prints and FRS. You can read the draft by clicking here. Back in 2005, DPS signed a purchase order and a contract (see part 1 and part 2) with Digimarc, an Oregon company with a website that seems to play down its role in facial recognition software. The contract is worth almost $30 million. DPS also produced copies of its memorandum of understanding with the FBI, which allows the FBI to use facial recognition software to compare photographs against the DPS drivers license database. All of this appears to be tied to the FBI’s Next Generation Identification (“NGI”) project, which the Electronic Privacy Information Center has been following for several years. I’m new to this beat, but a lot is happening with FRS and data collection, and I’ve been surprised by how little attention it gets from the mainstream press. 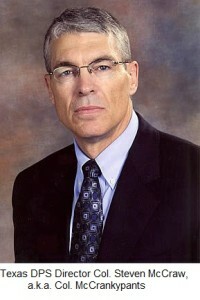 One very notable exception, however, is Dave Lieber of the Dallas Morning News. In an April 30, 2015 column, he explained how former Governor Rick Perry and none other than Col. McCraw have built a surveillance state in Texas. It’s a must-read, as is his April 25, 2015 column about Trapwire, the Texas “fusion center,” and the suspicious business relationships among those who are building the fusion center. A few others seem to be paying attention as well. The Cincinnati Inquirer has been dogging the use of FRS in Ohio, and the Russian site RT.com has some of the most persistent coverage of FRS use in the West. On March 18, 2015, a Texas Senate committee voted to restrict DPS’s collection of biometric data. In the previous week, the Electronic Frontiers Foundation raised concerns about a similar data collection effort underway in California, all of which seems to be designed to create a de facto national database. Interestingly, the documents produced by DPS say nothing about Trapwire. The contracts only mention Digimarc. So is Trapwire subcontracting through Digimarc? If not,why isn’t there a contract with Trapwire or another parent contractor like Stratfor? It looks like I have some more digging to do. Since I am new to this beat, I intend to share all of the documents that I received from DPS with reporters / activists elsewhere, because I am sure they will have far greater insight than I do. In fact, I’ll probably just upload the documents to this blog. Stay tuned. Does the Texas DPS director have a persecution complex?